A lot of external parasites of livestock and horses are flies. Flies are insects that belong to the Dipterans, i.e. those insects that have one pair of wings. Other parasitic Dipterans of veterinary importance are mosquitoes and keds and midges. 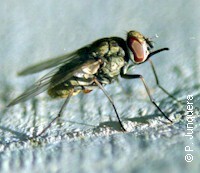 One feature common to all Dipteran flies is that they undergo a complete metamorphosis (they are holometabolic), i.e. their life cycle goes through four major developmental stages: egg, larvae, pupae, and adults (=imago). The life cycles are species-specific and can be very different. Some fly species deposit eggs on dung, others on plants, others on garbage, others on carrion or directly on animals, others in water, etc. The articles on each species in this site provide additional information. You can select such a specific article on the corresponding menu. Click here to learn more about the general biology of insects. On a global scale, flies are especially harmful for cattle, and less for sheep, pig and poultry. Dogs may be annoyed by some fly species as well (e.g. stable flies). Flies are less of a problem for cats. Harm is caused through biting and blood loss, associated stress, transmission of various diseases, maggots that feed on the tissues of the host, contamination of milk and other products, etc. There are three major types of parasitic flies. Black flies, gnats, mainly Simulium spp. Ocur worldwide and can be a regional problem for grazing livestock in endemic regions. Horn flies, Haematobia irritans. Occurs worldwide and is one of the most damaging external parasites of cattle. Significant resistance problems. Horse and deer flies, Tabanus spp, Chrysops spp, Haematopota spp, etc. Occur worldwide and attack all kinds of mammals. Horse louse flies, Hippobosca spp. Occur mainly in Africa, Asia and parts of Eastern and Mediterranean Europe. Attack mainly horses. Stable flies, Stomoxys calcitrans. Occurs worldwide and is a significant parasite of cattle and pig, but will bite any mammals, and even birds. Tsetse flies, Glossina spp. The most damaging parasitic fly of cattle in Africa. Face flies, Musca autumnalis. A moderate problem in cattle, mainly in the Northern Hemisphere. Head flies, Hydrotaea irritans. A problem in sheep in certain regions, mainlyin Europe and Asia. Houseflies, Musca domestica. Occurs worldwide: the most cosmopolitan fly species. Can cause serious problems in pig, poultry and dairy and feedlot facilities. Significant resistance problems. Filth & nuisance flies, Fannia cannicularis, Muscina stabulans, Ophyra spp, Sarcophaga spp, etc. Can cause moderate problems in pig, poultry and dairy and feedlot facilities. Blowflies, Lucilia spp, Phormia spp, etc. One of the most damaging external parasites of sheep in Australia, New Zealand, UK, Ireland and South Africa. Significant resistance problems. Horse bot flies, Gasterophilus spp. A common gastrointestinal parasite of horses, donkeys and other equids worldwide. Human bot flies, Dermatobia hominis. A serious parasite of livestock, pets and humans in tropical and subtropical Latin America. Nasal bot flies, Oestrus ovis. A frequent parasite of sheep worldwide. Screwworm flies, Cochliomyia hominivorax, Chrysomya bezziana. Found worldwide mainly in tropical and subtropical regions. The most damaging myiasis of livestock. Has been eradicated in North America and parts of Central America. Warble flies, cattle grubs, Hypoderma spp. Frequent in the Northern Hemisphere on cattle. Wohlfahrtia magnifica. Frequent around the Mediterranean and Asia, mainly on sheep.